Face it - Civil War is the best superhero movie of 2016...so far. It's going to take an awful lot for movies like Suicide Squad or Doctor Strange, as good as they look, to grab the top spot away from it. And a great movie always drives lots of interest in great collectibles. Dragon, a company once known for sixth scale figures, have been re-born with an emphasis on statues and other unusual items, as well as their first love, models. 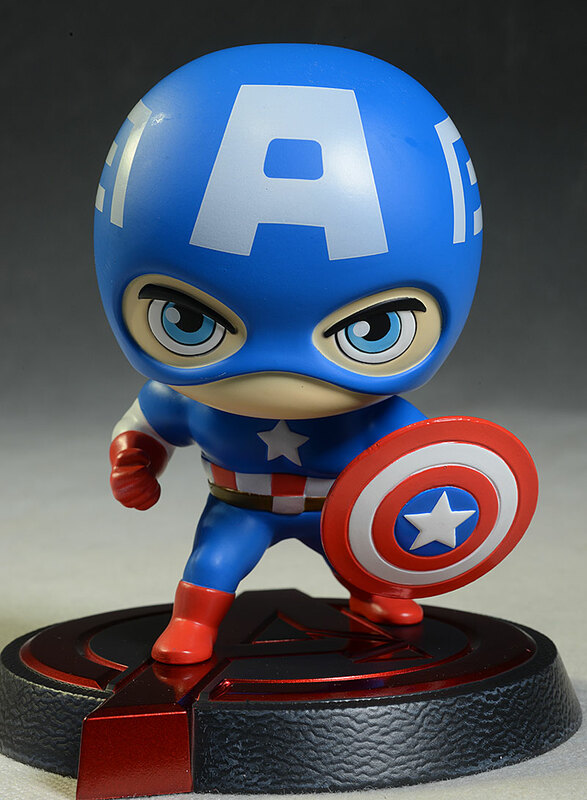 I'm looking at one tonight that would fall into the unusual category - their Hero Remix Captain America bobblehead. Dragon is looking to produce very high quality items, even in categories like bobbleheads where quality hasn't always been job one. That drive for quality also drives price, and this guy isn't cheap, coming in at $30 - $35, depending on the retailer. The plain black box is collector friendly of course - no need to damage anything when removing the figure - but it does tend to be rather 'meh'. A big plus is the very large window, which allows you to clearly see the actual product you'll receive, but that's only helpful if you are purchasing this guy in person from your local comic shop. 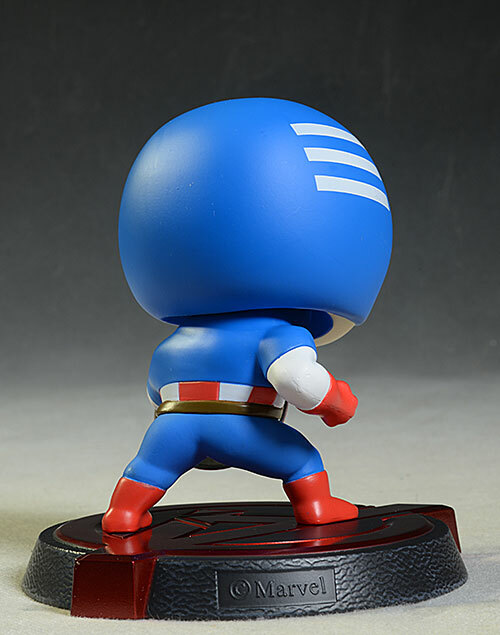 This Captain America is part of their Hero Remix series, and also a part of the Civil War themed wave that includes Scarlet Witch, Falcon, Ant Man, War Machine, Winter Soldier, and others. These bobbleheads stand about 5 inches tall, including their permanent base. 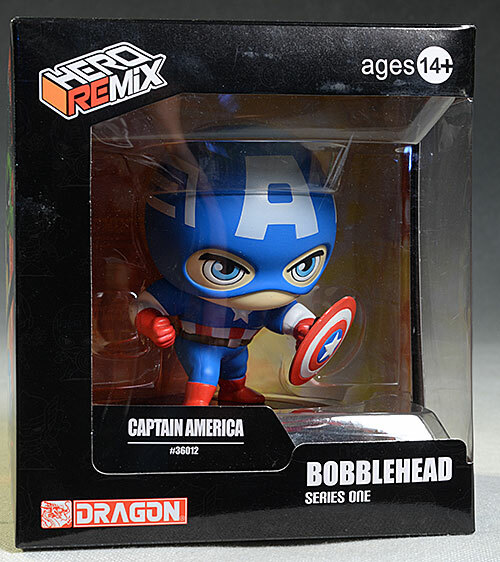 The Hero Remix design is definitely cute, with a large head, large eyes, and no mouth or real nose. 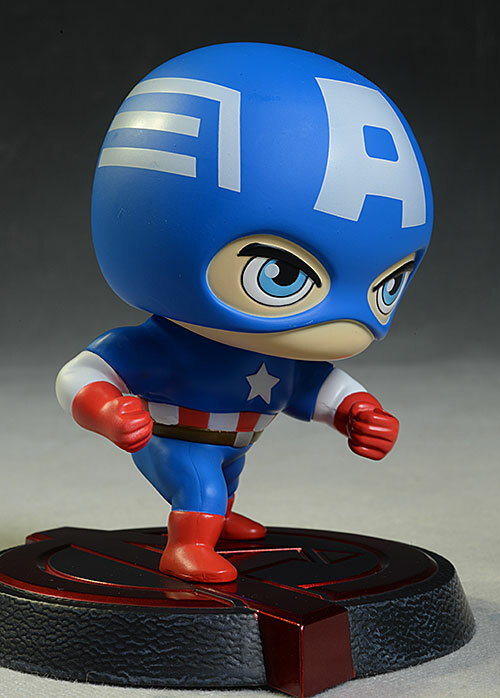 Cap has an aggressive, dynamic stance, but is still about as cute as a bug in a rug. There's not a ton of detail in the sculpt, but certain edges, like around the various parts of the eyes and elements of the suit, are cut to add depth. 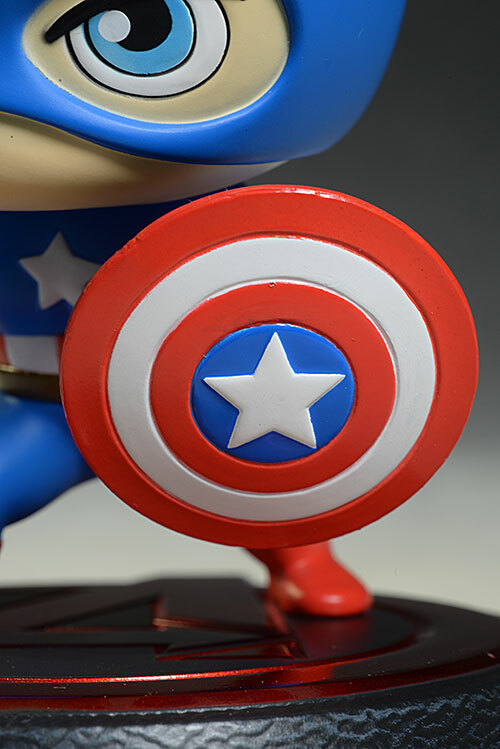 The shield is removable, a nice feature since you can display Cap without it if you'd like. The only way it could be improved is with some way to attach it to his back, but alas, there isn't one. One of the concepts behind this and all the Dragon products is high quality paint. They have done a nice job here, particularly on the face and eyes. There's a few rub marks on the matte finish, which is not too surprising with a matte finish. There's also a slipped edge here and there on the shield and body, and a spot of dirt in a couple spots, but they are fairly minor issues overall. I suppose the bobble movement of the head - which works quite well - could be considered 'articulation' but I'm not going there. This won't hurt his overall, since I generally don't expect bobbleheads to have any other articulation, but it's worth noting for information purposes. As I mentioned, the shield is removable, and I'm counting it as an accessory since you could easily display him without it and not be too out of place. The paint work could be a little cleaner, but making it detachable was a nice choice. Bobbleheads aren't particularly 'fun' in the traditional sense, but you can get some amusement out of the bobble action I suppose. 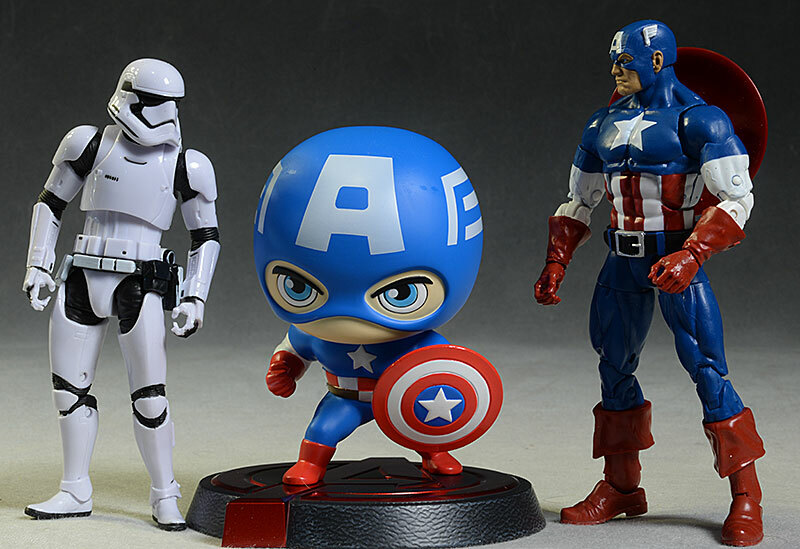 These are really collectibles, not toys, and as such won't be too affected by this category. But here's the killer - that great looking paint work and cute design come at a cost. 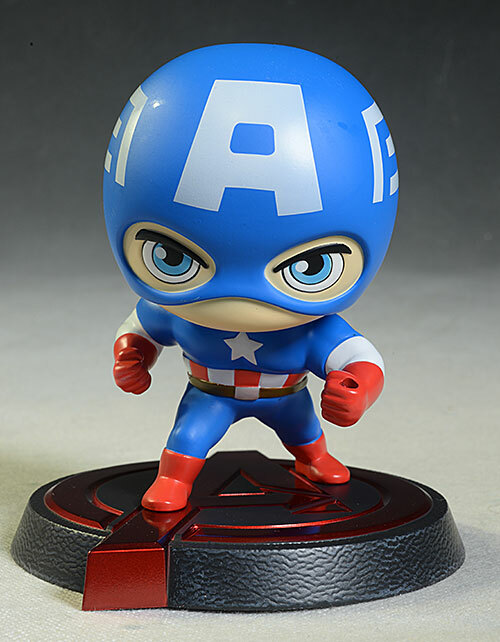 Since this is an import, prices can vary, but I've seen him in the $30 - $35 range at most retailers. That's a lot for a bobblehead, even a high quality bobblehead, and will make casual collectors think twice. Not a thing that I can see. When you have one of the modern Dragon products in hand, there's no doubt the quality is there. In my office I have both the Dragon Hulk and the Kotobukiya Hulk, and the difference in quality is clearly evident. And it should be, because there's also a distinct difference in price. 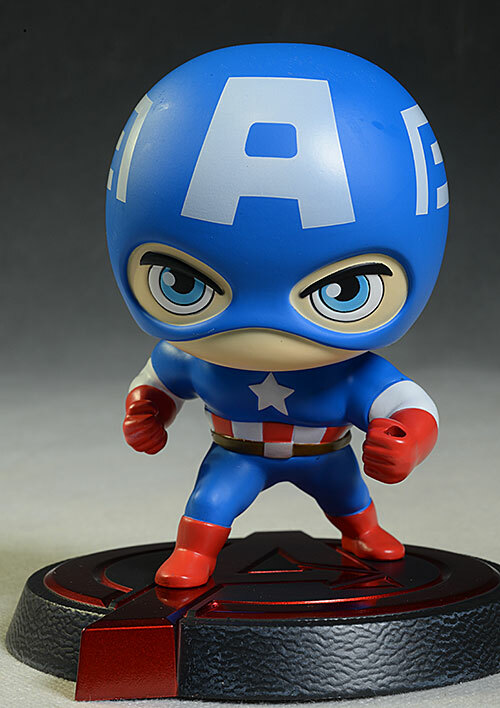 There's still a pretty big bobblehead market out there, with most product running between $10 (for stuff like the Funko figures) to $20 (for slightly higher end NECA designs). At $30 - $35, this guy is well beyond that, and while the quality is certainly good, it's going to be a bit of a tough sell for people accustomed to the lower prices. - has him for $35. - Entertainment Earth has him for $30. 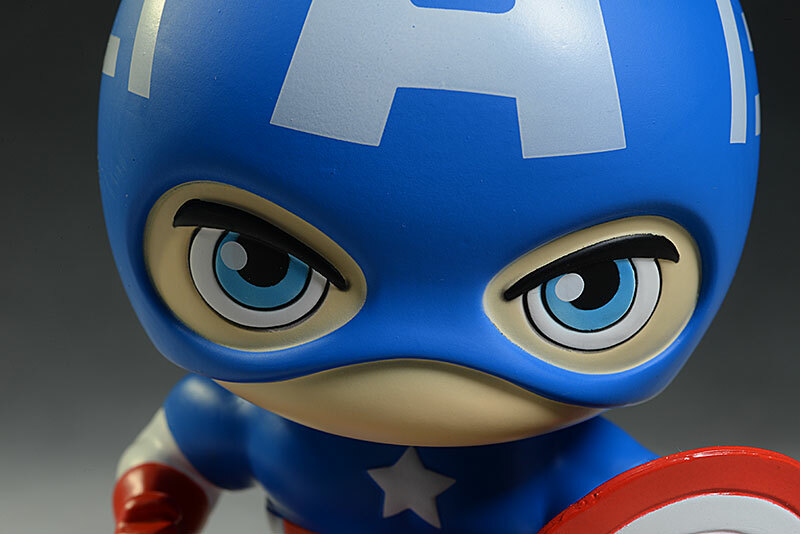 I've covered lots of Captain America goodies, but another from Dragon is their high end statue. 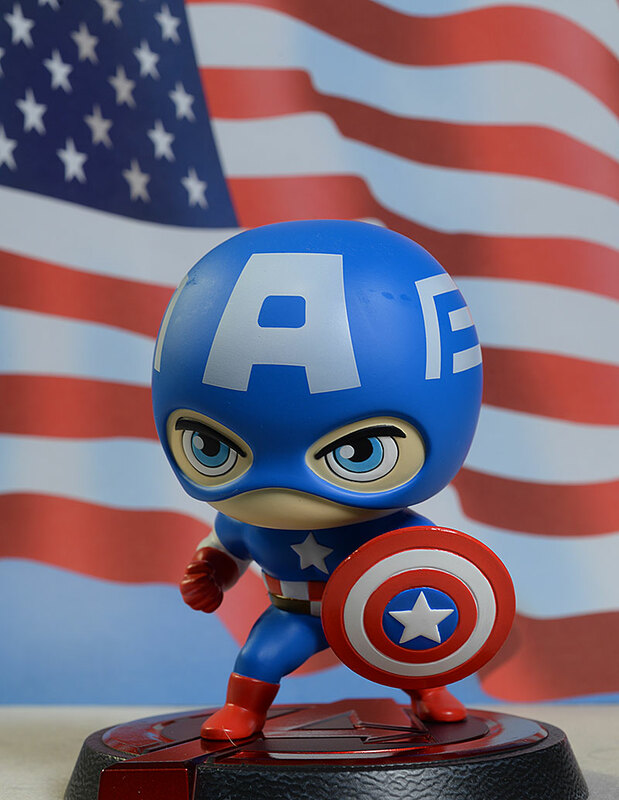 You should also hit the Search Reviews page to find a ton of other Captain America relates reviews, and in case any other applicable reviews were done after this one was published.